Adobe's Flash technology is now available for iOS devices, thanks to a new application for jailbroken iPhones and iPads. Coming from Comex, the same man who developed the browser-based JailbreakMe tool, Frash lets iPhone users view Adobe Flash content on their phones. Frash is in its very early stages, and works with the iPhone 4, 3GS (with iOS4), third-generation iPod Touch, and iPads with the latest software (3.2.X), the developer says. To install Frash, you will also need to jailbreak your device, which can be done easily with the new Web browser-based JailbreakMe tool released last week. Once you have jailbroken your iOS device and installed Frash (RedmondPie.com has a simple step-by-step guide), you can view Adobe Flash in Mobile Safari. Not all Flash content will work though. Frash is in the early development stages (version 0.02), so only basic Flash animations will display, mainly advertisements. Here's a video showing Frash in action on an iPhone 4. Apple's relationship with Adobe's Flash technology on the iPhone was bumpy from the beginning. The company refused to include the technology into its mobile devices, saying that it would cripple the experience and battery life. Apple CEO Steve Jobs also explained at length in a public letter his reasons to sideline Adobe's technology. 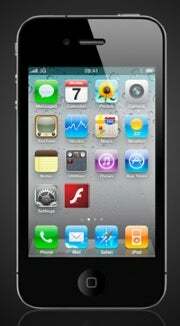 Some iPhone users were not happy with Job's decision, and looked into getting flash on their iOS devices. Comex's Frash should keep those users happy momentarily, until a better version of the software is developed. As for jailbreaking, the procedure came into legality two weeks ago, when the U.S. Copyright Office ruled it as an exemption of the Digital Millennium Copyright Act (DMCA). However, Apple doesn't agree with jailbreaking, and says that the procedure will void the warranty of your iOS device, meaning no free repairs in case something goes wrong. To fix that, you can always use the Restore option in iTunes.